Have you seen these impressive structures? Rapunzel wouldn’t have enough hair to let down from this tower in St. Louis’ Compton Heights neighborhood. One of only seven remaining standpipe water towers in the country (three of which are in St. Louis), the tower reaches 179 feet into the air. The tower is open for climbs up the 198 interior stairs on Saturdays and on full-moon nights. Designed in the French Romanesque style, the exterior is clad in limestone with brick and terra-cotta ornamentation. A 360-degree view of St. Louis from the observation deck is the pleasant payback for the climb. 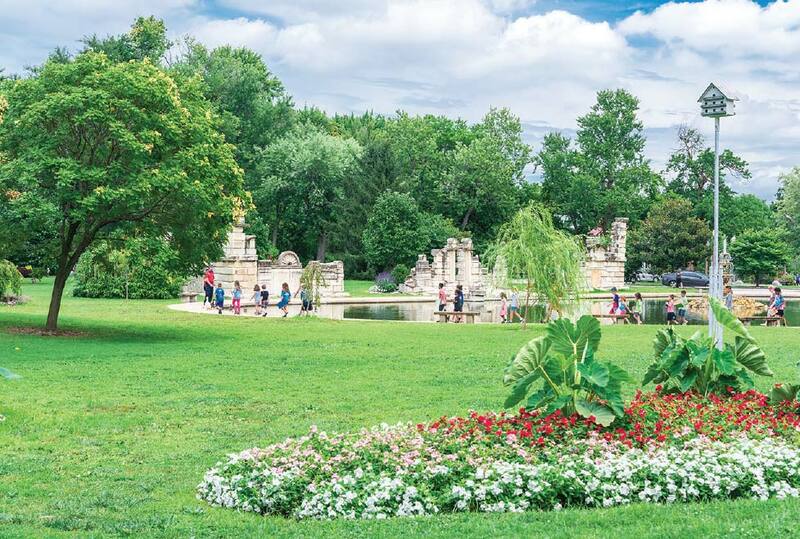 One of the only remaining Victorian walking parks in the nation, this landmark greenspace on the south side of the city is dotted with many delights for architecture fans including original gazebos, a bandstand, a beautiful palm house and even a set of faux ruins overlooking a picturesque pond. Visitors can enjoy a Saturday farmers market, take a carriage ride or take part in the many festivals that use the park’s avenues during the year. You’re not in the Royal Chapel at the Palace of Versailles, you’re in St. Louis. You’d be forgiven for thinking the classic European interior of this former 1925 movie theatre was in France instead of Missouri. A stained-glass depiction of the city’s namesake, King Louis IX, graces the building’s front elevation. Listed on the National Register of Historic Places, the building is now home to the St. Louis Symphony Orchestra, the second-oldest symphony in the nation. It was the largest and busiest building of its kind in the world when it opened in 1894. Designed by Theodore Link in the style of the French fortress in Carcassonne as a nod to St. Louis’ Gallic heritage, the building is as spectacular and ornate on the inside as it is on the outside. Look for the clock tower, whispering arch and lighted elements in the Grand Hall. The first of its kind to use steel truss construction, this span now carries cars and MetroLink light rail trains. When it opened in 1874 as a solution to railroad access across the Mississippi River, an elephant first crossed its length to prove its strength to a skeptical public. Architecture buffs argue whether it’s the world’s first skyscraper because of this downtown building’s multistory steel-framed construction. But there’s no argument that the terra-cotta embellishments on its 1891 exterior give this office building designed by world-renowned architect Louis Sullivan its colorful cachet. One of the most historically significant buildings in the U.S. is also one of its most architecturally important. Originally opened in 1828, the structure’s cast-iron dome, designed after the dome on St. Peter’s Basilica in Rome, was under construction in 1861 at the same time as the one on the U.S. Capitol building in Washington, D.C. Inside, the landmark has been restored, with artist Carl Wimar’s murals depicting St. Louis’ history on the soaring ceiling. The Dred Scott slavery trials were held here, leading the country toward the Civil War. Is that really a school bus dangling over the side of this warehouse of fun? Can that be an airplane hoisted into the sky? Those are just a couple of the many oddball items visitors will find added to the exterior and interior of this former shoe factory. Salvaged architectural elements are collected into a museum within the attraction and others have been melded into the facility’s structure and given a new life. Opened in 1929 as a palace for motion pictures, this gem has been described as Siamese-Byzantine in a bid to explain its opulent interior. Today, visitors can go on an architectural safari to spot the elephants, lions and other creatures that caper through its interior as they watch the best of Broadway on the stage of this Grand Center landmark. This Art Deco-style conservatory, finished in 1936, sits in the center of Forest Park. More than 4,000 panes of plate glass in a warm verdigris patina allow light to pour into the interior where floral displays enhance weddings and special events throughout the year. A reflecting pool mirrors the exterior and makes a great stop for photographers. Every quiz has one question that is a true “gimme” and this is the one. By law, it’s the tallest structure in St. Louis and defines the skyline as one of the nation’s most-recognized landmarks. Designed by architect Eero Saarinen, this National Park Service-operated attraction is a monument to President Thomas Jefferson and his vision of a United States that stretched across the continent. This downtown building first opened as part of the city’s convention center and municipal auditorium in 1934. The lovely interior of its main theatre seats 3,500 people for concerts, comedy and touring musicals and its decorative lobbies are used for special events throughout the year. The classical exterior of Missouri and Tennessee marble is guarded by two 10-ton limestone bears. 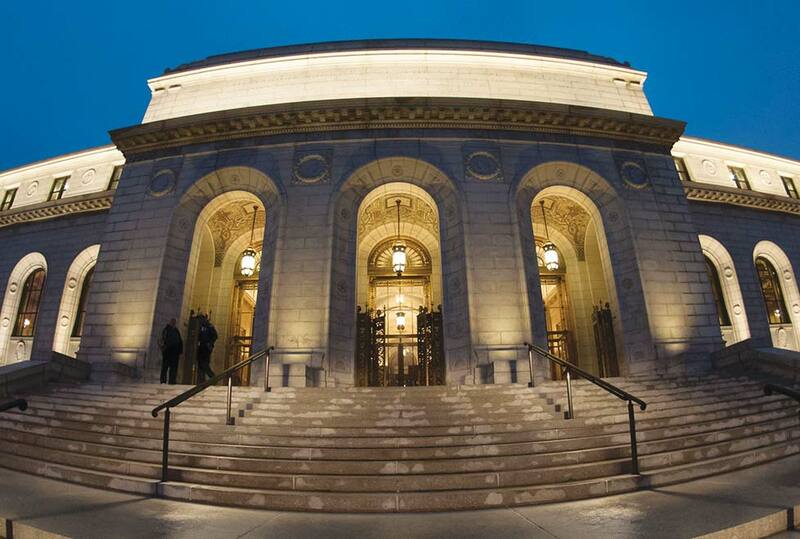 Central Library has been renewed for the 21st century by a $70 million interior and exterior restoration. Today, visitors can take tours of the amazing architectural gem to marvel at rooms decorated from ceiling to floors with rich colors and patterns. Programming includes special exhibitions staged throughout the year that encompass themes of history, literature and culture. An ancient pyramid appears to loom over downtown St. Louis high atop this building. Built in 1930 as part of the City Beautiful movement to open monumental structures in city centers, the rooftop temple was designed to resemble one of the Seven Wonders of the Ancient World: the Mausoleum of Halicarnassus. A pair of sphinxes guard the top and winged creatures sit at the four corners. Check out this itinerary to dive deeper into the French cultural connections that shaped so much of the city’s architecture.